Cherie started in hospitality over 25 years ago, met her now husband and Chef, Mark Poulter, in 1999. In 2017, with great excitement and anticipation Cherie has been instrumental in the design and fit out of their newly located Veraison Restaurant. With Cherie’s talent and flair, nothing has been left to chance. Everything has been carefully chosen from the stunning light fittings, the bold and colourful original artworks, unique crockery and quality glassware. Cherie and Mark are both locally born and their vision is long term. 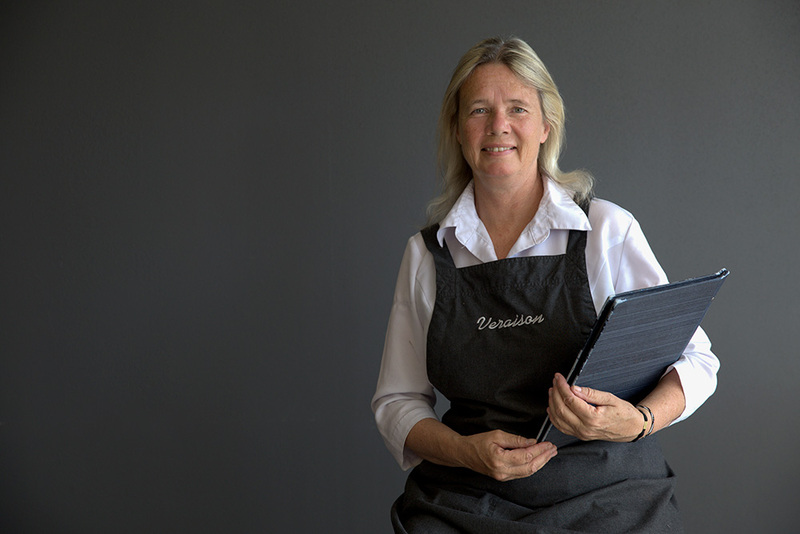 ” We don’t just own the business, we work in it and on it” says Cherie. For Cherie it is about excellence and making an experience memorable. It is about people. “I love making those connections and developing those long term relationships. We have people that celebrate their weddings with us and then later we get to see them as they start a family and create those memories”.